The original 22mm TeslaTun dry trap tundish has been assisting installations for 18 months now. Following on from the success of the TeslaTun22 and after listening to installer feedback, Tesla UK Ltd has launched the TeslaTun32 to market. 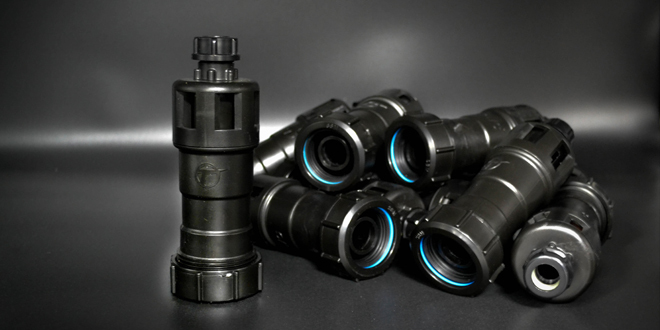 The 32mm TeslaTun has been created through the joint product development efforts of both Tesla UK Ltd and Reliance Water Controls / John Guest Speedfit. The TeslaTun dry trap tundish achieves four functions in one innovative, compact design. The type AA back-flow device which incorporates a waste trap, saving time and cost during installation. The specially designed seal prevents odours or gases from entering the building, whilst still allowing discharged water to be conveyed to waste safely. The Tundish operates under full bore discharge or with only a few drips due to its unique design and is ideal for use with any pressure relief valve on unvented cylinders, boilers, under sink water heaters and instant hot water taps. The WRAS approved TeslaTun enables the installer to provide a faster, easier and cost-effective installation as the all in one solution eliminates the need for additional traps. The TeslaTun32 is NOW available from all good stockists. If you have any questions on this range please call Tesla UK Ltd direct on 0121 686 8711 or visit wwww.teslauk.com. What is the Tesla Powerwall and how does it work?